You can't talk about Pennsylvania Dutch recipes without including something pickled. 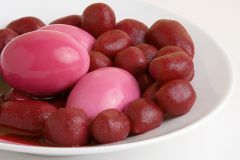 And red beet eggs are simply another pickled food. My family adds them to the menu at every family gathering, including our traditional Easter and Christmas dinners. 6 hard-boiled eggs, whole with shells taken off. Heat the beets, vinegar, and sugar together until sugar dissolves. Add the eggs to this mixture; the juice needs to cover the eggs. Make this recipe at least one day early so the eggs absorb the pickled taste and turn a deep red beet color. Kissin' wears out . . . cookin' don't!